Well this was my last week of Diet Chef and I lost another 1lb. That's 5lb in total for the month of May added to the 8lbs in April - that makes 13lbs (genius mathematician that I am!) so not quite 14lbs Rachel but if you had said to me in March by the end of May you would nearly be a stone lighter then I would have taken that. I'll get Emma to take some pictures next Wednesday seeing as its half term and you can tell me what you think. My stomach has definitely gone down and my jeans feel better but still have a belly. I lost more weight in April but having said that I did really reduce my calories so would have expected the same results with Diet Chef had I started with them in April. Ultimately, in my view, if you want to lose weight you need to be eating in and around the 1200 calories mark. We all eat far too much and think we eat less calories than we actually do. Now, I haven't stuck to the diet religiously - I went out on Friday night for a meal but that's life. My sister had to cancel her BBQ due to the rain. It rained pretty much all day so we had a Chinese take-away instead. I didn't order my usual ribs but special fried rice and king prawns hong kong style. So to another week. I didn't get up at 7 am to complete my kettlebell workout but I did complete it at 11.00 am. I loved it! It was great fun and I did work up a sweat even though the dvd was for 25 minutes. Perfect length of time. I think once I get used to the work out (there are two - I am on the easier of the two) then I'll increase the kettlebell weight from 4kg to 6kg. I use this dvd and it works on our region 1 dvd player - if you don't have one it won't work. I also had a 10 minute punch on the punch bag. 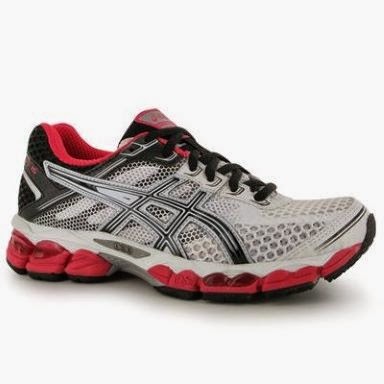 I also ordered some new trainers - whilst they weren't cheap they came highly recommended for my heel. They feel really good on my heel so lets hope they are just the ticket for working out and walking. By the way I always thought they were called Basics for some reason! So that's all my news. Another grotty day here of rain. A winning combination of no car and half term! My friend is coming up tomorrow with her two children and I'm meeting some other friends on Thursday and Friday with the BBQ re-scheduled for Saturday. I have lots of posts to write which I hope to do this week! Excellent! Well done you! And what's one little pound between friends? Are you going for the next stone now or are we done?